Chippewa Men's 25415 USA-Made 9 Inch Tan Waterproof Insulated Logger Boots, still crafted by hand here in the USA, are an excellent example of classic Chippewa quality, durability, and comfort. They know men's boots and rugged wear for your work environment becau ... (see full details) (see specifications) #CHP25415. Chippewa Men's 25415 USA-Made 9 Inch Tan Waterproof Insulated Logger Boots, still crafted by hand here in the USA, are an excellent example of classic Chippewa quality, durability, and comfort. They know men's boots and rugged wear for your work environment because they've been in business for over a century. Trust their time-tested knowledge and feel the difference for yourself. The golden tan waterproof leather uppers will fit right in at your job site, whether you are driving the logging truck, operating machinery, or supervising the crew. The Chip-A-Tex waterproof construction and Ruby Dri-Lex 2000 lining will keep you moisture-free for a comfortable day's work. You'll appreciate the waterproofing that comes from the Chip-A-Tex waterproof booties. In order to keep you warm, 400 grams of 3M Thinsulate Ultra insulation is within the American-made boots. This loftier layer will give you comfort and coziness, yet it's still thin enough to allow you to have complete freedom of movement. It's designed to withstand some of the harshest conditions, and it even retains its insulating capabilities in damp conditions. The removable orthotic Texon 460 waterproof inserts in the Chippewa boots will cushion your feet in all the right places for a rested feel all day. The cushioned collar offers ankle comfort and support. The most superior support, though, will be provided through the 1-inch wide triple-ribbed steel shanks. These will lend your arches that much-needed support they really need. When you're wearing these USA-made boots, you'll be able to notice the benefits as soon as you set foot in them. The antique brass, non-tarnishable milled studs, hex eyelets, and heavy duty waxed sta- tied shoelaces are extremely durable. These tough laces will stay tied until you decide otherwise. The Vibram Honey Tacoma Yellow Plug Logger outsoles are made durable by the Goodyear leather storm Welt construction. This type of construction carefully stitches the leather uppers to the rugged outsoles. The soles are also non-marking, oil-, and slip-resistant for additional traction on uneven surfaces. 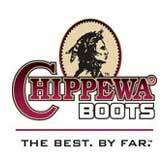 Trust Chippewa and Working Person's Store to provide you with rugged performance waterproof boots. The Chippewa Men's 25415 Insulated Logger Tan Boots are standard Chippewa quality, durability, and comfort. I work as a railroad conductor and get one to two years out of a pair of boots before they need replacement or resoled. I've tried many different brands always trying to buy the higher end made-in-usa offering. These Chippewa boots I liked so much I bought a second pair after a few in-between years of Danners which I switched to partly for the lower heel. The logger heel on these Chippewas won't hold onto the little rubber cleats I wear in icy conditions and also the logger heel is more prone to twisting my ankle on the rough ballast where I do a lot of walking. The only reason I give them 4 out of 5 stars is because toward the end of my last pairs lifespan they began to come apart inside the sole. I will add that my pair fit so tightly at first I was worried about the size but I stuck with it and was rewarded with some of the most perfectly fitting boots I've ever had. They need break-in. It might be fair to say they are cut narrow so order wide. I have had two foot surgeries and now have plates in my foot. These are the ONLY boots I can wear all day long. I often work in wet conditions and have purchased a boot dryer because I often have to put them back on the next day and I do not have to worry about the quality after they have dried. Chippewa boots are pure pleasure is you have to be on your feet all day. 1 pair for work - 1 for dress. I love these boots. Can't go wrong. Had 1 bad pair which were swapped out in 2 weeks. A lot better than buying from local retailer for 30% more. Peace - my bride loves them as well. I have the tan and the black Chippewa 9" insulated logger work boots. I live in Florida and I wear them every day. I come from the North and grew up wearing these boots. Everyday on my job-site people ask me where I get those and I say Working Person's Store. They last on average 3 years without new soles. Cheaper than Wal-Mart if I buy a pair every 6 months. Well worth it. These boots keep you dry, warm, and cool. I just received another order from you folks, and again, it's fast and great quality. Thanks for your quick response and quality. I'm a concrete man, and quality is very important to me. Thanks so much. Chippewa Boots: Men's USA-Made 25415 Tan Waterproof Insulated Logger Work Boots is being added to your cart.